Blowout Sale! Free Shipping Included! 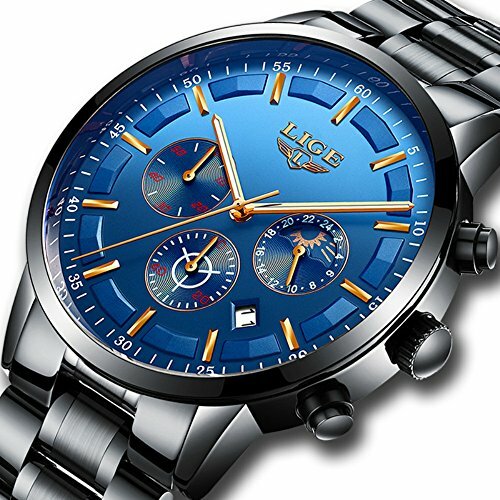 Save 86% on the Mens Stainless Steel Blue Classic Luxury Casual Watches with Multifunctions Chronograph Sport Watches Waterproof 30M Moon Phase Business Fashion Quartz Wrist Watch for Men by SUNMEI at Watches Sales. MPN: L-9877. Hurry! Limited time offer. Offer valid only while supplies last. This fashion business casual watch is designed for men. It's a luxury, beautiful, multifunctional, high quality watch, which is great for daily uses. This fashion business casual watch is designed for men. which is great for daily uses. The style is suitable for any occasion. durable stainless steel band give it a very elegant and sophisticated appearance,making it perfects for both business and casual activities. Notice : All of Sub-dials And button are good working. The color may be a little different due to the effect of light and moniter setting. Please do not press any buttons in the water or wear this watch for longtime underwater activities. Try not to let the watch in contact with steam and hot water, such as don't wearing a hot bath and so on. 1. PRECISE TIME KEEPING:High quality Japanese quartz movement with digital analog display provide precise and accurate time keeping. 2. Cool miltary sport style, suitable for all kinds outdoor activities,such as:running,climbing,rocking etc.And aily use is also a fashion watch.Perfect for all kind of casual,indoor activities or daily use.Luxurious package with Fashion design and good quality make it a great gift for your family or friends as well as love it. 3.DIGITAL ANALOG DISPLAY with MULTIFUNCTION:Multifunction display,Date and Day,Backlight,Stopwatch,24 Hours,shock resistant etc,unique buttons design,easy to set time. 4.WATERPROOF FOR DAILY USE: waterproof (30 M), HANDWASH, SWIMMING, NO PROBLEM ! Perfect for all kind of business, casual, indoor activities or daily use. NOTE: Please DO NOT press any buttons in the water or wear this watch for longtime underwater activities - such as diving, ect. If you have any questions about this product by SUNMEI, contact us by completing and submitting the form below. If you are looking for a specif part number, please include it with your message.